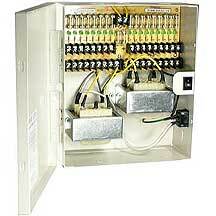 Power distribution boxes are mandatory to form electrical connections in a building or floors. You can find quality power distribution boxes at SF Cable can order power distribution boxes from the comfort of your home or office. We have 9 Port AC24V 4 Amps Power Supply Box w/ Resettable Fuses, OA-P24AC9P-4, 16 Port AC24V Power Supply 8Amp 1U Rackmount, 18 Port DC12V 12Amps Power Supply Box UL, OA-P12DC18PUL-12, DC 12V 8 Amps Power Supply box (9 Port), 16 Port DC12V Power Supply 10Amp 1.5U Rackmount, 18 Port AC24V 15 Amps Power Supply Box, OA-P24AC18P-15, and other products. SF Cable provides you quality products at most competitive prices by sourcing the products directly from manufacturers. Satisfied customers are the ultimate goal of our store. We also provide lifetime technical support on our products.